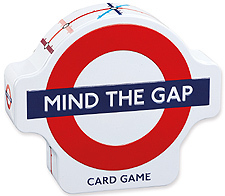 Step on board for a trip around London's famous Underground, with this quick-play card game featuring well known stations from the tube. Simple but engaging, this game is just the ticket for young travellers to old timers alike, the aim of the game being to get rid of your cards first. Each player is dealt 8 cards and must match a coloured line from the previous card in order to play. Special cards may help or hinder your journey - avoid delays and get rid of your cards before other passengers catch you out - but above all make sure you MIND THE GAP!